The plot for Mega Man III I’ve read in MM25 seems completely different to that on most wikis (less oil rig takeovers, more supercomputers going nuts basically). Just how different is the Japanese plot to the Western one? The one in Mega Man Official Complete Works and MM25 is, exactly as you thought, an English translation of the Japanese plot synopsis. Months after the last battle (meaning Rockman World 2), a supercomputer (or a network of supercomputers, perhaps) that regulates things like automated transportation, localized weather control, and municipal and industrial resource needs appear to go haywire in cities all over the world, followed by robot rampages. The manga implies that computers around the world are being hacked by signals sent from the first Wily fortress in the game. There’s no mention of an offshore oil rig drilling for magma energy to be found in the Japanese manual, despite the final Wily steampunk-themed fortress that emerges from below the sea. So it seems to me that the Japanese story focuses more on the first fortress, and the English story on the second. 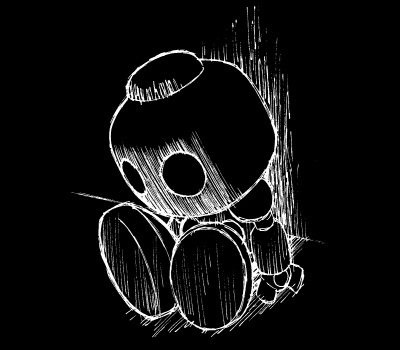 Do the Wily Machines in III and Wily Wars and IV’s final boss (after the Wily Robo Iron Golem) have official Japanese names? I’ve heard the latter be called a Wily Capsule, but it seems “Wily UFO” is a more likely name (Capsules are usually separate things). To my knowledge, throughout most of the 90’s (until around Rockman 8), the UFO was the term for the vehicles Wily would ride around in, waggling his eyebrows as he typically sped off to some skull-themed fortress stage. “Capsule” was the term for the vehicles Wily would do battle in after a Wily Machine was defeated. This changed with Rockman & Forte’s final form being the “Wily UFO”, and sometime after that they started referring to pretty much any vehicle Wily uses that flies as a Wily UFO. To date, I haven’t come across guidebooks that give official names to the World 3 or 4 or Mega World final form vehicles yet, but the second form of the Brain Crusher in World 5 is referred to as a Capsule by its guidebook, so I suspect that the pattern was probably still holding true at that point. As an aside, some have suggested that the name “Capsule” comes as an homage to Capcom’s namesake “CAPsule COMputers”, but I think it’s actually a reference to the pervasively popular influence of the Dragon Ball series in the early 90’s Japan, and that by the end of the decade GT’s popularity had wanted to the point where Capcom decided to distance Wily’s tiniest of battleships from the brand. I’ve read that Sunstar’s dialogue in the Japanese version of V is different (and that he willingly blows himself up with a bomb and doesn’t suffer a critical reactor failure). Is this true? Yes! In the Japanese version Sungod gives a bit more exposition about the civilization he, the Space Rulers, and the Wily Star were created in. He says that humans (yes, humans — not aliens) were constantly using machines as means of war against one another. But after being shown Rockman’s kindness and hope for peace between robots and humans alike, Sungod basically declares “Well, if there’s going to be peace, we don’t need any more combat robots and battle planets like this then!” But it’s unclear (to me at least) whether he had willingly set himself to blow up or if he had already been designed to blow up if he lost, and simply wanted Rock to hurry and escape the blast. He refers to what’s inside of him as a powerful bomb though, rather than his reactor going critical. Also by looking on the JP wiki page and using Google Translate, apparently the Skull Blazer has an ion battery, L./R. Knuckle were developed to make the Wily Star fight and apparently the Brain Crusher controls the entire Star? Not good with Japanese at all, so I’d like clarification. These details are from the Japanese guidebooks for Rockman World 5. The giant ion battery or cannon is the name of the huge beam the Skull Blazer fires from its mouth. I had once hoped to do an in-depth compare/contrast between the Rockman World 5 game story and the Archie version of the Stardroids, but the comic went on hiatus before that story was explored and I put my blogging on hold anyway, so it was not to be. Since you translate the manuals for Rockman 1,2,3,5, and World 2, would it be fine if you did manuals for Rockman 4,6,7, and the rest of the Rockman World series? I feel like they have information people in the USA barely knew about, especially in story. I had also planned on doing more of these manual comparisons, though the next one I had wanted to do was for the first Rockman X. I wouldn’t want to get your hopes up, but, maybe someday? I have been pondering Mega Man’s deadly foe for sometime. No, not Dr. Wily. Those instant kill spike hazards! In your vast collection of Rockman lore, has there been any mention of why those deadly variety have such a violent effect on Rock? Why do some spikes kill instantly while others only damage him? Is it purely game mechanics or has some other reason ever been stated? I’m afraid I can not recall any specific in-universe explanation for why most spike traps are insta-kill. The quality is a bit low, so I can’t figure some of the kanji. Alternate acceptable romanizations aside, the only ones that stick out to me are that “Cline” is　クラインG “Cline G” (Green?) in this game, “Cubelectro” is simply 発電機 “Hatsudenki” which means “electric generator” (“Cubelectro” is cuter), and “Passworder”　is メロディ対応砲台 Melody Taiou Houdai, “Melody Response Cannons/Battery/Arsenal/Fortification/Blast-trap” whatever sounds best to you. Also, does the truck/bus enemies from Nitro Man’s stage in MM10 have any official name? They were missing in the R10 soundtrack, and I don’t know if they appear in R25. Seeing the Retro X and similar posts, I wonder if you can make a Mega Man’s Soccer coverage? I looked some 1993-1994 magazines around the web, but it looks like Soccer was not well covered before and even after its release. Also, was it even covered in a gaming event like CES, ECTS, …? One thing I noticed is that many soccer games were released, apparently due to the World Cup ’94 (bandwagon). I wonder if MMS was rushed to be released before the cup and compete with the other soccer games? Average US magazine coverage for (unpopular) games in those days would be a small column with a short blurb and maybe a photograph as an upcoming game announcement, and then a half or full page review once the game actually came out. Mega Man’s Soccer was definitely reviewed, though I can’t remember specific Magazines off the top of my head. I definitely agree that the game development appears to have been rushed. But then, most Mega Man games are! In Japan on the other hand, because Super Famicom mania was in full swing, Rockman’s Soccer received not one, not two, but three (!) separate stand alone guidebooks, as well as multiple manga. I can’t say I think it’s deserved, but I guess I’m glad it exists anyway. Not to beat a dead horse, but maybe I’ll get around to sharing them at some point. Capcom Design Works and other art books would be one place, and I suppose the internet is always a good place to check. His homepage profile lists only a fraction of the projects he’s been involved in over the years. I wish I knew more about him, honestly. Hi, question about Mega Mission… is it really “Remeet”? I was thinking that “Remeet” was meant to refer to the revived Repliroids, but that doesn’t seem to work for things like (what is probably called) X’s Limit X Buster. I think “リミート” is an unusual way of writing “limit”, and Google seems to suggest that there is some very minor usage of it. I did consider this back when I was translating the cards, and I still feel that this is a perfectly legit way to look at it. 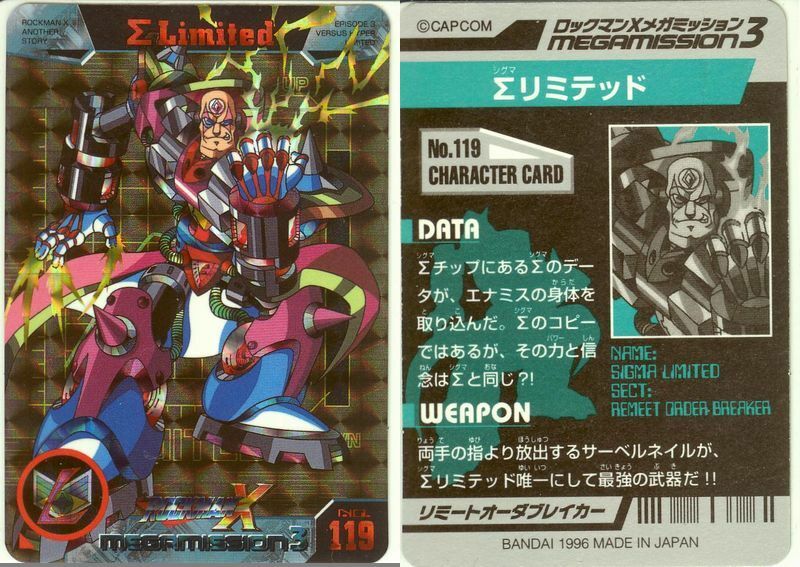 But “REMEET” is written out in English on the back of the Mega Mission 3 cards, so that’s what I went with. When analyzing these terms that are loanwords from outside Japan, you sometimes wind up with a lot of different potential ways to interpret it. What does “remeet” mean to the designers? Rematch? Revised? Remade? Reborn? Did they choose “remeet” because of its similarity when written in katakana to “limit”? It’s all plausible, so I just defaulted to how it was written. You can see examples of the cards backs on this page. Unlike almost every other boss enemy in the series, the X-Hunters’ transformations seem to have no official art and no developer commentary. Serges in a tank is one thing, but Agile in a… tube? What IS that thing? Capcom must have explained at some point, surely! I see it labeled as a transformation, but what manner of transformation is not really made clear so far as I know. Because we do know from Yoshihisa Tsuda’s comments that the X-Hunters/Counter Hunters were originally a foursome called the Shitennou (“Four Heavenly Guardians”) and that each of them was supposed to have a secondary vehicle form, there’s a strong parallel between them and the Zero series Shitennou characters, who also happen to have vehicle transformations. Agile’s body transformed into a flying formation. Other than his head that’s attached in the center of the form’s frame, there is nearly no similarity to his former appearance. Did Glyde create the Birdbots? Who makes the Loath/Glyde Family’s mechas? The Birdbots? Glyde? I don’t know the answer to any of these! Is Loath really dead in MML2? I don’t know a definite answer to this either, but the plaque in Glyde’s battleship might point to yes. Is there any info on the master system and elder system in MML2 books? Sort of! What the Elders, or Elder Gods/Titans, refer to at the end of DASH2 have never been made clear. But there is clarification that the Master built the Mother units, Trigger, and is responsible for the library on Elysium and so on. Do you have the Rockman DASH 2 Final Digouter’s File? There’s only a few storyboard images in that book, but I’ve added it to the que for if I ever get to really blogging again. Knowing me, I would want to translate all the character remarks that goes with it, but it’d be a slow process because I feel I am awful at writing dialog. The primal movers in charge of our universe have yet to see fit to grant me unrestricted access to all Japanese gaming magazines and ephemera throughout time. 🙁 But I am still on the lookout for this! At the very least, I believe the Chinese Adali cards did have a colored version of the World 3 machine from the manga, but I have not come across that yet either. Lastly there’s another string of questions by Gauntlet101010 that generated some interesting conversation over at the Ask page, but I’m going to stop here both for length and because I think the rest is worth pouring through more carefully at another time. If anyone wishes, feel free to chime in with your own thoughts. 9 Comments to "You Asked For It"
Cool, I wanna see the manuals comparisons. Yeah! I always wondered how the World games fit into the timeline. They could take place inbetween many of the games, inbetween 8 and 9, in their own separate timeline as a reboot of sorts, or really any combination of these. Hmm. Maybe I myself need to write up my own hypothesis on that. Having the manuals would definitely help. Is the Ask Page a yearly answered thing? I’d like to ask something, but I think I have to wait for 2017. There’s no deadlines to the Ask page. I also don’t plan on clearing it out even after I’ve answered them, so do whatcha like! Your planned comparison of the Stardroids got me curious. What was the Japanese story for the Stardroids (or rather Star Rulers), and how does Gigamix’s Stardroids compare? Thanks so much for looking #20! And running this great blog! It’s always nice to hear from you!! I hope you have a great 2017! Wait, there were four X-Hunters? Any idea who was the fourth? That part I can answer (it came up in my attempts to figure out Agile). All we know about the fourth X-Hunter is that it would have been a woman! So there’s one more piece of the “Four Guardians” picture. I’m starting to think the planning process for the GBA games was pretty much just Inafune deciding, “I will do everything I couldn’t do in the X series.” He made Zero the star as he’d originally wanted, and now we know the Guardians were pretty much his original plan for the X-Hunters. Next we’ll be hearing that Dr. Cain was always meant to be a teenage girl. Ohhh, right — thanks! I’d forgotten about that! I thought 20 meant in-fiction that there used to be four (which, with X-Kai, I guess that’s sort of true? ), and that took me by surprise.